First things first, let us visit this resource. Opening front page does look a little too crowded. In my opinion offliberty.com has the best interface, very easy, very little margin of error of clicking where you shouldn’t.. Here we see 2 parts of the page. Above the fold there is the actual converting mechanism in the header pretty much. Below the fold there’s a ton of unwanted stuff, ads, some kind of “history” that offers you videos that people before you converted.. well.. a metric ton of useless stuff.. You’re coming to convert video to mp3, why would you care what others are converting? I must admit and warn you, even before i get to the Negative Thoughts about flv2mp3.org: this site has extensive ads, too many… There’s always at least 2 ads on the page, one on the very bottom never-disappearing one, always there when you scroll.. And there’s a bunch of new windows and tabs that I’ve just noticed opened up since I’ve been clicking around flv2mp3.org and checking stuff. apparently, every click you make there opens up some annoying ad in a new browser tab or window.. please, beware!! try to minimize your clicks not to have some malware somewhere sneak in. Read this tutorial and check what and where to press to get in and get out. And if you don;t care where, then best visit sites like TheYouMp3.com or even Anything2mp3.com – also with ads but a much better experience.. it’s the popups that make it so much worse.. So basically the part with “be careful” that I’ve just added to the subtitle actually means “be careful, don’t get malware or similar unwanted programs and search engines and stuff like that“. Why so many ads? Why so intrusive? Yes, this is not a big deal to find this out. Many groups of websites usually have single facebook account and they are not hiding it. It’s rather they are trying to mass all their followers and users of different websites under same social page, why not? But see what happens when that goes on? Site owners actually prioritize and select 1 of their sites as the “main” one, which gets most traffic or best conversions, and start pushing that site. While 1 or several more other sites, that usually do same thing, but you know, internet is vast, people are billions, so why not start another same site with different messages (keywords) on it, maybe it performs better than others? So in this case flvto.biz is the main site, while flv2mp3.org is one of the side-shows.. And thus owners don’t really care for this site, and users’ experience on it. They just go for the money. And the more popups, the more user gets confused into clicking those ads (obviously, they are not google’s ads, so anything goes), the more money they get. This can be easily done by mouse Right Click and SHOW URL or any other option that lets you copy the URL. You can also always copy it from the browser window URL box, simply click on the address bar, and press CTRL+A to select all the URL and CTRL+C there to copy into clipboard. First we get the conversion progress, as depicted below. It took about 15 seconds for this 5 minute video. Well, let’s download the mp3.. Or at least TRY…. And here we come to the fork.. Next page is automatically flagged by my chrome browser, trying to notify that making the next step and going to the page with actual download link is UNSAFE. you can see it on the screenshot below. Whole page is red and the message is clear: if you keep going deeper in, – do not blame anyone but yourself.. This is the feature most browsers support now, trying to prevent people from visiting dangerous resources (not dark web or anything, just sites with malware and spyware).. And in this case it is one of those bad sites. As I’ve stated above, before the tutorial, flv2mp3.org is a side-show site that owners don’t care about, thus they stick most atrocious, most annoying and the sneakiest advertising there is… And here is the result… Even browsers now warn people not to visit. And this is not necessarily bad stuff on flv2mp3, it is something that this popup ads wants to open or some malware ad redirect, so yes, it’s not necessarily their fault. But it is their fault for placing shady advertising on their site..
Well, we are brave, or at least I personally know how to get rid of all the nasty malware that can get installed, or how to avoid installing it.. So we go ahead. 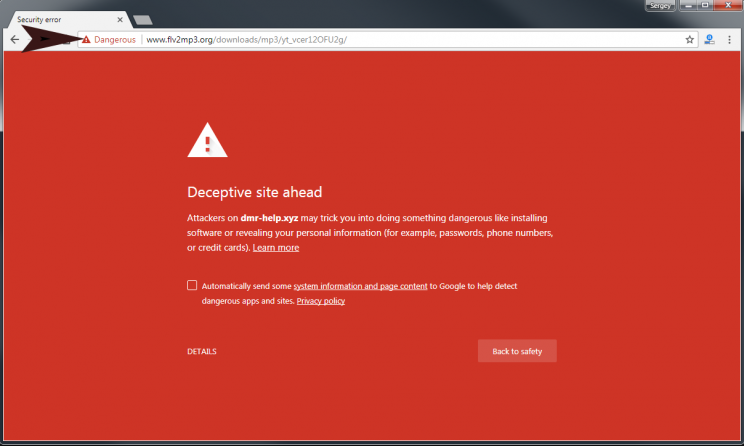 To circumvent browser’s warning and keep using this site, click on details link in the red window, and then click continue to this site. And what do we get? Well, thankfully chrome has blocked the popup, but audio from it still got into my life… very annoying. so i rushed and did the download ASAP and closed that page (forever). Nevertheless, if you did get through the warning red browser page, click the big download button to the left. And download the mp3. VERY SLOWLY.. my download speed was 15kb/s, and took about 15 minutes..
5. I have changed my mind and am not doing test of youtube video to video conversion and downloads with flv2mp3.org..
well, i don’t really know. Since this FLVTO Downloader is probably the product they are trying to push on their main site – flvto.biz, then the software is probably acceptable. Unless it’s free, then i would not recommend it, since it’ll be ridden with malware, i just know it. If you need a download manager – try youtube-dl, it’s free, it downloads from playlists, and from over 1000 websites.. if you don’t mind m4a instead of mp3, – try keepvid.com, it’s also a slick new design site with lots of traffic. But for FLVTO Downloader – i don’t know.. better stay away..
yes, it’s true, the site can help you out with video too. They will most likely convert online video into AVI or FLV files, making them HD or not HD. You know, i do need know if that site can allow for 1080p with sound video downloads, but i simply cannot make myself go back there.. Seriously, it’s not worth it. So what if the do 1080p HD youtube converter to FLV or AVI? even if they do, i will never use their service for anything. after clicking to switch language – couldn’t close the popup , very sneaky, had its own “stop from showing more popups” message that showed more popups.. took me a while to overpower it. Too many ads, nasty ads, sneaky ads, malware promising ads, and on top of that – a few more ads. Do not use this site, it’ll make you mad with ads and popups, sound and all..